Zhoushan Port Free Trade Zone was officially approved by the State Council on September 29, 2012. On January 7, 2013, the state Council approved the Developing Plan of Zhoushan Archipelago New Area, making it clear that the Zhoushan government should accelerate the construction of the zone, explore establishing a Zhoushan Free Trade Park and Zhoushan Free Port when circumstances permit, and build the Zhoushan Archipelago New Area into an important island-gateway city in China. As the first step of the development strategy, the zone was considered the forerunner and innovator for the Zhoushan Archipelago New Area. Furthermore, the zone was a significant measure for Zhejiang province as well as Zhoushan in deepening reform and opening-up pursuant to the directions of the 3rd Plenary Session of the 18th CPC Central Committee. On November 22, 2013, the Zhoushan Port Free Trade Zone was approved after inspection by 10 ministries under the lead of the General Administration of Customs of China. It officially started operation on January 8, 2014. 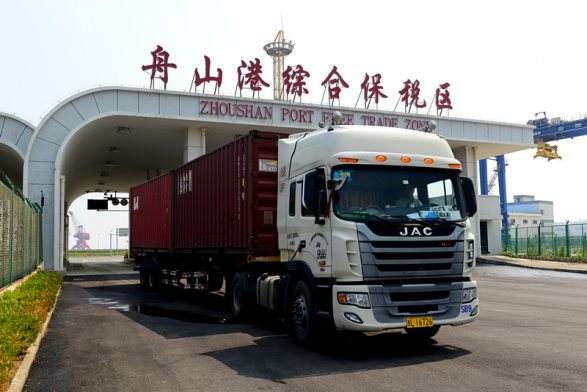 As the first comprehensive bonded zone in Zhejiang province, Zhoushan Port Free Trade Zone followed the national level policy of developing the marine economy with the approval of Zhoushan Archipelago New Area. an important base for imported commodities; and an international logistics distribution center for bulk commodities. Based on the mode of 'Two Sub-zones under One Bonded Zone', Zhoushan Port Free Trade Zone established the Zhoushan Archipelago Sub-zone and the Qushan Sub-zone, with a total planning area of 5.85 sq km. The Zhoushan Archipelago Sub-zone mainly focused on developing advanced manufacturing industries, such as storage & logistics, marine equipment, marine biological industry and electronic information. It has also explored establishment of a regional bulk commodity pricing center and developed relevant service industries such as shipping, insurance, consulting, research & development, exhibition and commodity leasing. The Qushan Sub-zone is situated in the Shulanghu Island of Qushan. The second phase of the Zhoushan Port Free Trade Zone, it has a planning area of 3.02sq km and is only 10 sea-miles from an international waterway and 22 sea-miles from Zhoushan Archipelago Sub-zone. It has one 400,000- ton berth, two 300,000- ton berths, one 100,000- ton berth and three 50,000- ton berths, which can all accommodate dry bulk vessels. What’s more, it has three berths for liquid bulk vessels of 300,000 tons, 100,000 tons and 50,000 tons. Qushan Sub-zone is ideal for developing storage and shipping of bulk commodities such as ore, oil and coal because of its advantages in deep coastal lines. As the core area of the Zhoushan bonded fuel oil supply center, the sub-zone is planned to to have a 3 million cubic meter oil storage capacity. In January 2014, it made a successful test of supplying oil for ships at outer anchorage. Relying on the advantages of its deep water coastline and geographical position, Qushan Sub-zone plans to build itself into a storage, transferring, processing and trading center for bulk commodities and a regional bulk commodity pricing center to improve international discourse on pricing of bulk commodities and ensure the safe supply of China's bulk strategic commodities.